Strawberries. Ice. Rum. What’s not to love in a strawberry daiquiri? Pre-bottled mixes, that’s what. As with the margarita, and every other libation known to man – I’ve found that drinks are always better when made from fresh ingredients right in your own home! My girlfriend is getting married in June, and requested strawberry daiquiri cupcakes for her beach wedding (recipe is coming Friday!). I found a couple of recipes that looked promising, but they all used fresh strawberries in addition to a store-bought mixer. I decided to take matters into my own hands, strike two birds with one stone, actually have fresh pureed strawberries IN the mix. It’s pretty much a glorified strawberry simple syrup – but it’s wonderful! Great when blended with ice for a strawberry daiquiri, on top of ice cream, or a little bit in your glass of lemonade will turn it a gorgeous hue of pink. In a small saucepan combine the water and the sugar over medium heat. Stir until sugar dissolves. 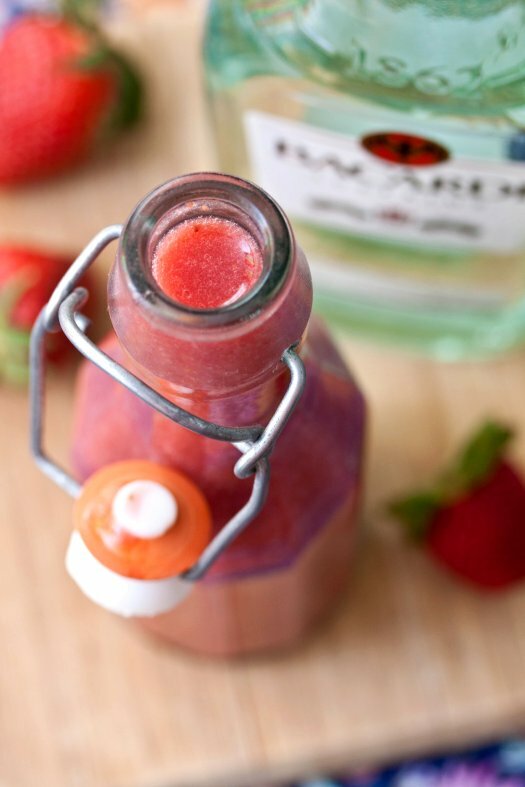 Combine lime jucie, strawberries, and sugar syrup in a blender and puree until smooth. To make a cocktail; combine 1.5 cups ice, 1/4 cup daiquiri mix, 2 sliced strawberries, and 3 Tbsp rum in a blender. Blend until smooth. Pour into a tall glass with a straw, and garnish with a strawberry. I’m slowly realizing that I may need to avoid your beverage blogs posts for the next 20 weeks! Of course I guess there is nothing to say that I couldn’t just mix this with ice and soda water or something…. Mmmm! And what a good friend you are, making delicious wedding cupcakes with from scratch daiquiri mix! I definitely have to make it. I have rum, I just lack sweet fresh strawberries. But spring is almost here and I’ll have them soon. Great recipe! hi! do you know how long this will keep in the fridge or freezer? thanks! I’d say 5 days in the fridge, Shelley. Probably up to 6 months in the freezer. I made a batch of this to test for a party I am bar tending.. The search is over!! I will be using this recipe. It is delicious..The best part, there is no high fructose corn syrup, dyes or preservatives. Thank you for sharing. Can you used frozen strawberries? How many cocktails can you make when mixing the recipe as shown?